Size: 16 inch. Mark Roberts Fairies Limited Edition Patriotic Spring Collection, Flexible and Posable Fairy Doll Collectible. 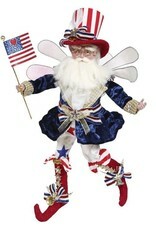 July 4th, Independce Day, Americana, Patriotic Decorations and Decor.